Rooibos Tea is a unique tea discovered by South African locals. The Rooibos plant only grows in an area northwest of Cape Town close to Cedarberg, and it's taken decades for this tea to gain mainstream popularity. 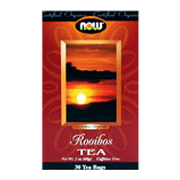 But the secret is out, and Rooibos Tea has become a popular and sought-after beverage. This earthy tasting tea is low in tannins and is naturally caffeine-free. other ingredients: Organic Rooibos (Aspalathus linearis) (leaves, branches, stems). Organic Rooibos Tea is shipped in a discrete, unmarked package. Orders are processed immediately and usually take about 3 to 5 working days to be received. We do ask that you try it for 2 to 3 weeks to feel the full effects. Any information received is used only for order processing and shipping purposes. Your information, such as e-mail address, will never be disclosed to a third party.